Saturday July 29th 1899 We took Mother home this morning Luther went too for the day. We found they had been getting along all right at home. They have a man hired and Lee is helping work the [road] there by Otts. I felt very tired when we got home, the dust is so bad. Sunday July 30th 1899 The day was spent quietly at home resting and reading when not busy with the work. Our sweet Edith would have been 18 years old today if she had lived. Monday July 31st 1899 I was busy with the work all forenoon. After an early dinner Will and I went over to Charlie Hodges and called at Ida Andersons. Did evening work. 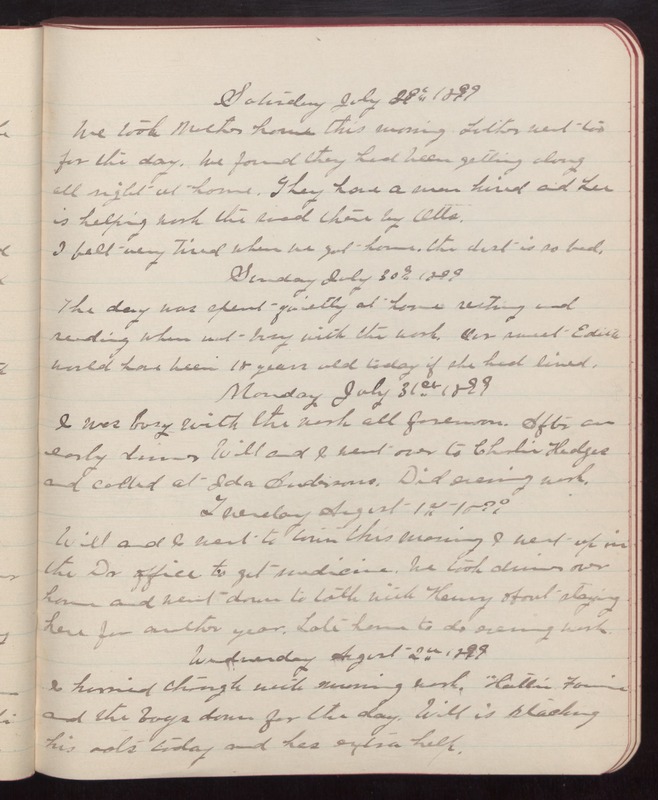 Tuesday August 1st 1899 Will and I went to town this morning I went up in the Dr office to get medicine. We took dinner over home and went down to talk with Henry about staying here for another year. Late home to do evening work. Wednesday August 2nd 1899 I hurried through with morning work. Hattie Fannie and the boys down for the day. Will is stacking his oats today and has extra help.